It’s easy to imagine the stereotypical revolutionary as a man clutching a gun or raising a fist. Yet revolutions are something bigger than this. For a revolution to be sustained it requires a mass of people and a huge, often hidden infrastructure to supply and maintain it. The popular image of the revolutionary masks the diversity of people and roles that revolutions actually require. The German Revolution of 1918–19 is no different. Much of our existing knowledge has focused on the leading figures, many of whom were men. If Rosa Luxemburg is often included as a counterexample of a woman revolutionary, the much wider role played by women largely remains in the shadows. Ignoring their participation distorts our own understanding of a watershed moment of German democracy. Yet today, research is seeking to put women back into this history. When war broke out in 1914, women and men across Germany were often conflicted about how to respond. If it is often said that outbreak of war in August 1914 was greeted with great enthusiasm, in fact it is difficult to read popular attitudes. In July 1914, more Germans marched in peace demonstrations than in the highly publicized patriotic rallies in support of the war. In the week preceding the mobilization, a total of 750,000 people attended thirty-two peace rallies held in towns and cities across Germany — 100,000 in Berlin alone. These echoed similar mass rallies in France and later in London, showing how many citizens of belligerent nations wanted to find ways of preventing the war while this was still possible. Officially, there was a political truce as all parties agreed to work together and censorship made it almost impossible to counter the official narrative. However, tensions remained beneath; Karl Liebknecht, then a member of parliament for the Social Democrats (SPD), and thirteen of his colleagues abstained on votes for war bonds, and the SPD itself split in 1917. Outside the political power structures, groups and prominent individuals were unsure how to respond to the war. Despite their pre-war commitment to internationalism and peace, the liberal, middle-class women’s movement was more than ready to commit its resources to organizing the patriotic war effort. Working-class women volunteered for the war alongside middle-class women within the national women’s service led by women of the BDF (Bund deutscher Frauenvereine) — the main umbrella organization for the liberal movement. These women engaged in patriotic war work and cut off international contacts. However, there were minority groups within both the socialist and the liberal movements that opposed the war. They reached out to their sisters in neutral and “enemy” nations with messages of solidarity and formulated a form of international feminist pacifism in their two meetings at the Hague in 1915 and Zurich in 1919. Women such as the feminist and pacifist Lida Gustava Heymann (1868–1943), the lawyer and pacifist Anita Augspurg (1857–1943), and women’s rights campaigner Helene Stöcker (1869–1943) were prominent in this section. Journalist and socialist Clara Zetkin (1857–1933) opposed the war, too, and also convened an international meeting of socialist women in Bern in 1915. These women, from Britain, Germany, the Netherlands, France, Russia, Italy, Switzerland, and Poland undertook great personal risk to travel through countries at war and meet women from supposed “enemy” nations. The delegates passed motions criticizing the increased cost of living due to the war and the persecution of Rosa Luxemburg. They called for an end to the war and for socialist groups in all countries to work together for peace and a socialist future. The manifesto of this conference was widely distributed in the warring nations and many women were politicized through their role in clandestinely passing on the text and discussing the ideas expressed. Opposing the war was dangerous; many women who engaged in antiwar activities were arrested. Rosa Luxemburg, for example, was imprisoned in 1916 and remained in prison until November 1918. Other women, such as the writer Claire Goll (1890–1977), went into exile. Some women refused to engage in welfare work in the hope that the people’s suffering would encourage them to oppose the war. Others, particularly those who had been involved in the liberal women’s movement before 1914, felt that helping those around them was their duty but they struggled to incorporate working-class women in their welfare work as anything other than the beneficiaries of aid. Socialist women saw establishing socialism internationally as the only way to end the war and stop future wars but there were disagreements about whether there was a specific role for women within this. It was difficult for women who opposed the war to have a united approach. Distributing antiwar messages was also very difficult. German censorship was mobilized almost immediately in August 1914 to restrict the ideas and information available to the public. The army authorities took control of censorship and had blanket control over all public debate and cultural production. They could ban articles from publication, close down papers that did not comply, refuse permission for plays, films, and revues, and prosecute any individuals or groups who were seen as undermining the war effort or German morale. In March 1916, New Fatherland Director Lili Jannasch was arrested on a charge of treason, held for fourteen weeks and released without trial on condition of promising not to engage in any political activity until the end of the war and not to disclose the terms of the agreement to anyone. Sharing antiwar ideas and developing resistance tactics were difficult and the consequences were severe. For historians, finding women’s voices can be very difficult, and the end of the First World War is no different. Women’s writing was often not preserved or passed on in the same way that men’s writing, particularly by soldiers, was. Furthermore, women were excluded from formal political power. They had only been officially permitted to attend political meetings from 1908, and the franchise was not extended to include them until 1918. Their workplaces also lacked many of the formal structures for activism. Women were well-represented in domestic service, an industry without official trade union representation and one where workers were often very isolated from one another. As a result, female workers did not often have the training or tradition of political activism that men did. And yet, despite these barriers, women found ways to participate in the revolution, in a variety of roles and at all levels. Even though it might initially seem difficult to find women’s voices, surviving letters, interviews, memoirs, and even police reports can provide valuable insights into their experiences and activism. Many women continued to oppose the war and opposition grew throughout the war years. The German home front experienced four years of misery; the Allied economic blockade was very effective and Germany rapidly faced shortages in food and raw materials. The harvest in 1914 was poor; Germany had relied on imports of chemicals for fertilizers before the war and so the food shortages worsened as the war progressed. The government was slow to react to the problem and prioritized food and materials for military use. The winter of 1916–17 was the worst and became known as the “turnip winter.” Wages did not keep pace with inflation, placing additional burdens on struggling workers. From 1915 there were widespread strikes, demonstrations, and riots. Furthermore, the Russian Revolution provided inspiration for left-wing activists in Germany. The Russian poor had been perceived as the most oppressed group in Europe. If they had been able to rise up and overthrow the Tsar, why couldn’t Germans do the same? When the German revolution happened, the revolutionaries set up workers’ and soldiers’ councils in a similar style to the soviets in Russia. The sharing of ideas and international cooperation continued into the 1920s when many German revolutionaries went to Russia to help establish the state and bring ideas back to Germany. Cläre Jung (1892–1981) began working as a secretary in Moscow but soon developed various aid projects, work that she hoped would be useful in a postrevolutionary society in Germany. Hilde Kramer (1900–1973) went to Moscow to help with translation, interpreting, and writing protocols. She ultimately found Moscow to be a disappointment; language barriers aside, the experiences of the Russian agricultural workers were so vastly different from the urban German communists that they struggled to understand one another ideologically. Women were particularly affected by the horrific conditions on the home front; they often took on new or additional work to replace the men who were away fighting and had the additional burden of providing for their families. Their work was not perceived as valuable in the same way as men’s and so female workers were often paid less than their male counterparts. As the wartime deprivations worsened, women began to organize. Police reports from large cities show the authorities’ concerns about women gathering in large numbers and using food queues as an opportunity to plan. In Munich, the police reported on daily marches organized by women protesting the terrible conditions they experienced. Marches and demonstrations grew in number and frequency, but it remained difficult to organize effectively. The Berlin-based writer and antiwar activist, Lola Landau (1892–1990) describes in her memoirs how she would attend a knitting circle, ostensibly to produce warm clothing for the needy but at the same time the women wrote antiwar flyers and planned how to share their message. Landau describes her trepidation at trying to distribute the leaflets; others had been arrested for this activity. These years of suffering and activism meant that Germany was fertile ground for a revolution; it just needed a spark. This spark was the sailors’ mutiny which began on October 30, 1918 in Wilhelmshaven, when some sailors refused to follow an order which effectively sent them on a suicide mission against the Allied fleet. The spark spread to Kiel when the sailors there were imprisoned; huge demonstrations began as tens of thousands of people took to the streets, calling for the release of the prisoners and the end of the war. By November 5, Kiel was in the hands of the revolutionaries, and within just two days, the revolution had reached Munich. The authorities attempted to repress the revolution, but many soldiers joined it instead. If we only focus on the sailors’ experiences, the revolution appears to be incited and organized by men. However, for it to spread as quickly as it did, the population had to be prepared and the foundations had to have been laid. The sailors’ mutiny may have started the revolution, but it was spread and carried by women. Even in a naval town like Kiel, we can see the important role women played. Gertrud Völcker (1896–1979) worked at the union office in the city center. She had been an active member in a socialist youth group and described the revolution in great detail: she and her friends in the socialist workers’ youth group marched through the streets, singing battle hymns and carrying flags. She saw the fight for equality as her own: “The fight for freedom, democracy, human dignity, social equality and solidarity became my own struggle.” Martha Riedl (1903–1992) was another young woman in Kiel who joined the revolution. She ran errands and messages for the revolutionaries, providing a vital line of communication and, as government forces tried to regain control, risking her life in the dangerous streets. Women were also involved in the leadership of the revolution. Rosa Luxemburg is perhaps the best known of the female revolutionaries but was by no means the only one. Our own research has turned up 256 women with recognized roles in the revolution, some of whom left accounts of their experience. Female membership of workplace councils is estimated at 5 percent of all representatives, dwindling to even lower figures in the higher echelons. There were only two women among the 489 delegates at the council conference (Rätekonferenz) in December 1918 and one, Kaethe Leu, began her speech pointedly with the address to the other delegate, Klara Noack, “lady and gentlemen …” These low figures are unsurprising given the barriers to women’s entry into recognized revolutionary fora, but they should not blind us to women’s broader revolutionary participation. 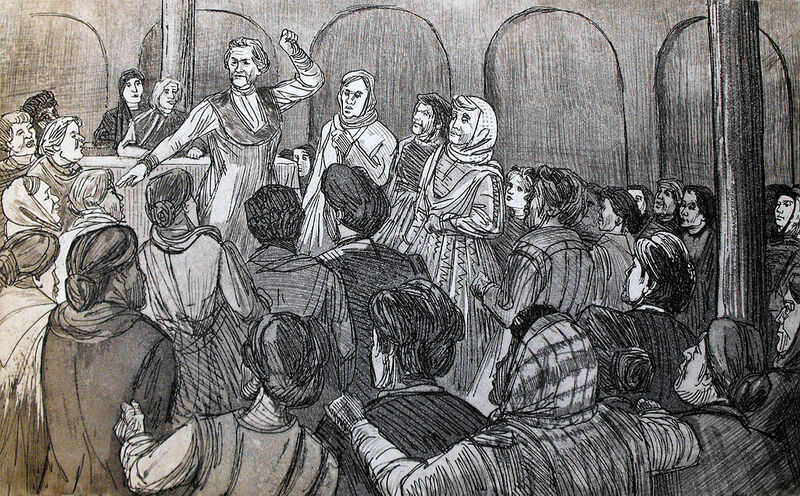 Questions were raised about women’s roles in the revolution and whether separate demands for gender equality were needed. The revolution introduced universal suffrage, something which campaigners in the women’s movement had fought for formally since the 1890s. Hilde Kramer was only eighteen at the time of the revolution, but she was soon playing a leading role in the Bavarian Soviet in April 1919 when she became the secretary to the city commander’s office. She was later arrested and spent time in prison as a result of her revolutionary activities. Despite holding an important position and being personally acquainted with many of the male leaders, Kramer does not feature in memoirs written by men; it’s as if they couldn’t see her. For all these women, the revolution was the bridge between their activism during the war or in the pre-war era and their later political careers. Kramer went to Berlin and worked for a variety of communist groups in both Germany and Moscow. When she emigrated to the UK in 1937, she worked for the Labour Party and drew up documents for the National Health Service Act (NHS) in 1946. Cläre Jung, who hid deserters from the German army and procured weapons for the revolution in Berlin, used the skills she had developed during the revolution to resist the Nazis. Heymann and Augspurg continued to write and edit their political magazine “Frau im Staat,” with the aim of educating women about their political rights and duties. They spoke out against Hitler in 1923 and called for him to be expelled from Germany. When the National Socialists came to power in 1933, Heymann and Augspurg were on the list of political enemies to be swiftly dealt with. Fortunately, they were on holiday in Switzerland at the time and wisely decided to remain in exile until their deaths in 1943. Their moral stand against the war did not come out of the blue — they had been campaigning since the late nineteenth century on equality issues and since 1904 for the vote. The experience of the war and the instability of the postwar context in fact strengthened and clarified the pre-war commitment to cultures of internationalism within the women’s movement, while their gradually increasing political influence in national and international politics heightened their sense of moral responsibility for protecting the fragile peace. The development of new and terrifying weapons and strategies of war that targeted civilian populations challenged the gendered division that separated men from women, combatant from noncombatant. Questions of war and peace could no longer be seen as issues separate from women’s concerns: in a hostile and threatening world, the imagined community of internationally minded women was urgently needed as a model for harmonious relationships between nations and a platform for building a sustainable peace. The revolution happened because ordinary people took to the streets and protested in large numbers. The regime had been repressive and imprisoned many antiwar speakers but people still found ways to work together and share information. They were willing to risk their lives to stop the war. For many, this opposition to the state was not new; they had been active in international networks before and even during the war when communication was difficult. They faced incredible hardships and took great risks. Remembering women’s antiwar and revolutionary activism is important for activism today as it gives women back their radical history and reminds us that political gains have never been wrested from the powerful and privileged without vocal, organized pressure and collective action, and that nothing has been won or defended without persistence, often over many decades. And it reminds those of us who might feel beleaguered in our own national context that women’s activism has a global dimension.